Three of my blogging friends, Meg, Snoskred and Andrew have setup an Aussie bloggers community project which had a soft launch yesterday. Our aim for this project is “empowering, encouraging, supporting and promoting Aussie Bloggers and the Australian blogosphere in general”. To facilitate this goal, we have established a group blog (which will be launching on the 21st January, 2008) and a forum which is now open for registration. You don’t have to be an Australian blogger though, all nationalities are welcome. I’m very excited to be a part of this project as a moderator for the forum and as a blogging contributor. The take-up of forum registrations has been phenomenal with 80 members as of this morning and 2262 posts in 286 topics. With the drive and passion of the founders and the moderators (I am a little bit biased here) I predict that this will be a valuable way of bloggers helping each other out and finding out information relevant to blogging. 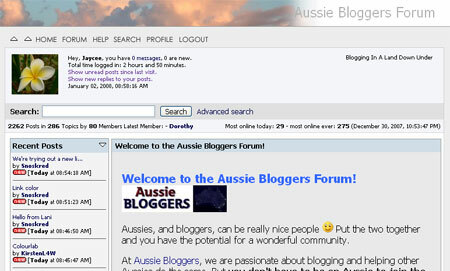 If nothing else it’s a good way to meet some fellow Aussie bloggers. I met a bunch of these people – virtually – last year and it’s been really good. Jen I’ve learnt a lot in just a few days and met some really great people who have fantastic blogs.